Around the top end of the non-leagues, it was rather unsqueaky right at the top towards the end. Thank goodness for the play-offs for keeping things interesting just below in each division. Of the ten leagues across the top four levels, seven of the championship trophies/shields/commemorative tea trays were sewn up well ahead of time, with only the committees of the Northern League (Premier) and the Isthmian League (Premier and Division One South) made to withhold their trip to the haberdashers for the appropriate adornments. The Conference and Southern League ribbon-tiers (and their staff) have apparently already thrown on their string vests, are knotting the final corner of their hankies, and more than acquiescing to some quality deckchair inaction. However, despite the top clubs in their fellow Isthmian leagues not playing ball, AFC Hornchurch made the life of their league’s mug-wrapping top brass that slight bit easier by winning their league by Easter. Just three years ago, Hornchurch were riding much higher, backed by an almost implausibly bizarre chairman and his money and top of the Conference for the first couple of months of its debut season. 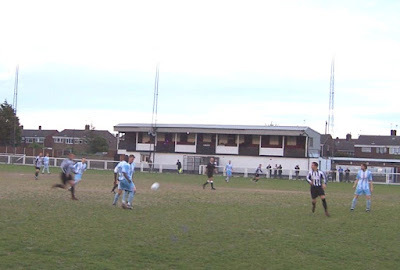 However it only took those few weeks for the cash to run out, and the club staggered through the remainder of the season before liquidating, and reforming in the Essex Senior League. Being able to command a richer purse than most in Essex, they ran away with the league, in an equally emphatic fashion as this year. 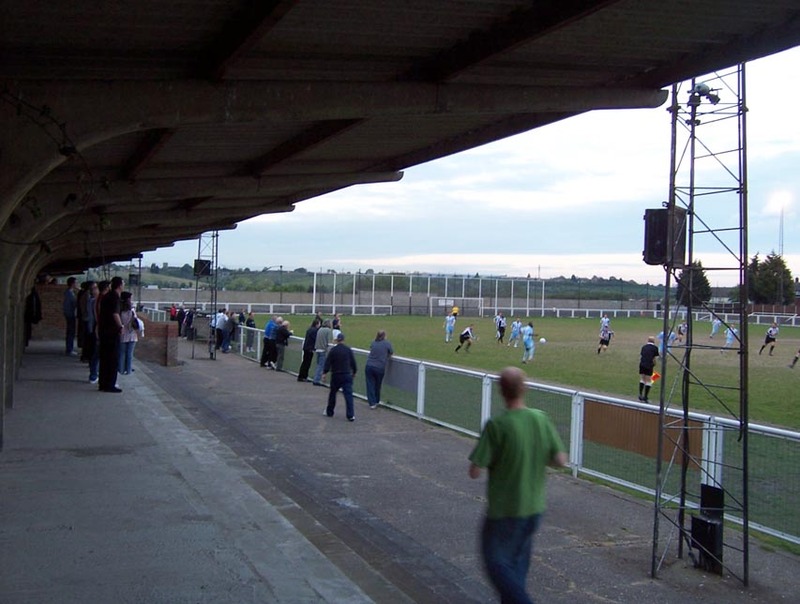 League restructuring at the end of last season meant that third place Tilbury could join them in this year’s Division One North, and thus they met again on a balmy April evening down by the docks. Tilbury have not had such an easy time of it this year, finishing 19th out of 22, Ilford and Flackwell Heath finding themselves relegated well in advance of stumps. With average attendances fluctuating around 77 and thus almost identical to the two despatched teams, Tilbury are doing well to keep their heads above water. Still, a cat might well look at a king, and as such the Tilbury players extend the wire-frame tunnel to form a guard of honour for the Hornchurch side as they enter their field. The claps of the Tilbury side actually drown out any ‘honour’ being directed Hornchurch’s way from the terraces which comes as a surprise, considering at least half of them are travelling Urchins. With almost three weeks as praise-worthy champions behind them perhaps, like an anaemic just off a Qantas flight to Gatwick, they’re getting a little weary. That said, they have a lot to look forward to, with a new chairman, the coming-aboard of some new sponsors and thus the apparent addition of three or four new players to beef up their squad for an assault on the Premier division next year. Who knows, their return to the Conference South could well come without any stalling whatsoever? The kind of cracks that could potentially consume a diminutive winger like a Venus fly-trap gape all across the pitch and have been plugged with sand to enable kick-off, just as well considering that after this game, only four days remain in the season to get some wet going, and thus the game. With the sand cast about, combined with the dryness of the earth, every committed tackle creates the kind of dust swirl that, had it occurred in 1930’s Oklahoma, would have caused Woody Guthrie to point the index-finger of his songwriting hand skywards as a light bulb clicked on above his head. With the surface being as it is, sliding tackles are not in abundance. However, Tilbury do put up a noble defence for the first half, in the face of sustained Hornchurch pressure, particularly from winger Amos Foyewa and striker Kris Lee, who keep Tilbury keeper Dean Neil on his toes, complimenting each other with passes for good chances in the first ten minutes. Lee, despite his Derek Pringle physique crashing around the Tilbury half like a slightly battered bargain-tray tube of cookie dough being repeatedly flung at a wall, looks particularly impressive. Tilbury put up a more than decent fight for the first 45 minutes, but all their hard work starts to unravel when Lee opens the scoring in added-time, powering a firm header through the diving Neil’s doily wrists. The teams return to the dressing rooms housed beneath the dark, dingey East Stand which appears to have been danked out of commission, usurped on the west side by a functional brick effort which already shows the signs of wear. It is, generally, quite an unappealing place to come, with wire fencing behind the goal at either end to stop stray shots, making the short strips of terracing behind each essentially redundant. On this warm night, not far at all from the docks, one spends half the time slapping flies away from yer ears. However, it appears Amos Foyewa’s biggest problem with the place relates to his nose. As he enters the field of play for a second time, he sniffs and asks a nearby team-mate “phwooaaaarrr, smell that” before screwing up his face so tightly you could store a tea-towel in it. Within four minutes of the re-start, Hornchurch put any ideas of Tilbury getting something from the game firmly to bed as Simon Parker flicks a Kris Lee nod-down over the sliding Neil. 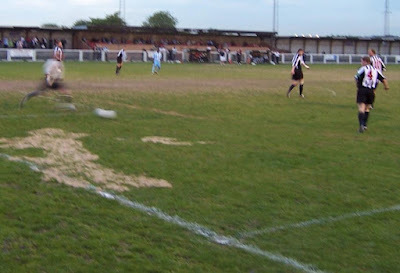 Quarter of an hour later, and Hornchurch kick through real sand to kick metaphorical sand in the collective, thick-frame bespectacled Tilbury face. The sixty second minute sees Parker put through by a long-ball and though stumbling from a clumsy challenge, he keeps his feet despite the fact that a fall may have earned his assailant a red card. He then flicks the ball over Neil, whereupon it hits both posts before finally settling into the corner like a cheeky long red along the balk. 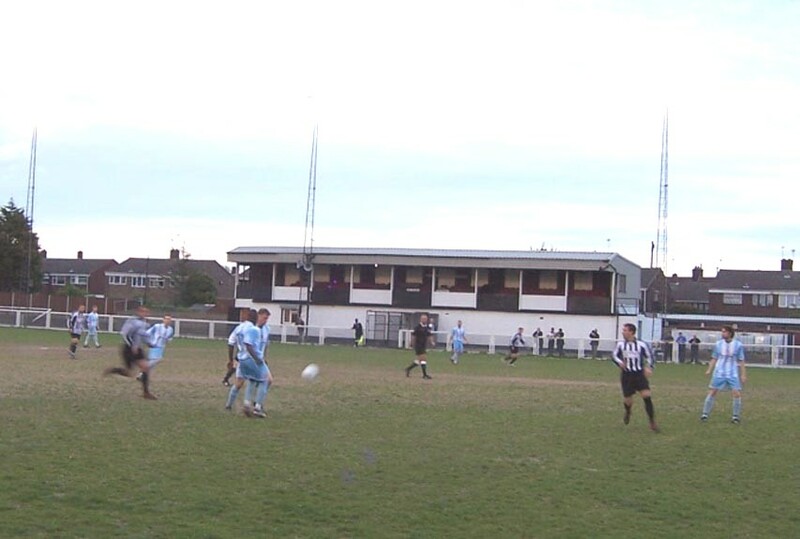 A minute later the elongated bean bag Lee completes his brace, and that completes the scoring. However both sides have decent chances in the last ten minutes, Parker missing out on a hat-trick as his shot crashed off the bar, Dave Sadler’s follow-up hitting the post. The home side also got something together, with sub Leon Antoine unleashing a shot from the edge of the area, and seemingly trying to fox Urchins keeper Dale Brightly with his slower ball, as he dives too early and has to reach up and scoop it away like a kitten being presented with the hanging carcass of a limp and defeated yo-yo. Not only top but, as of tonight, breaking the 100-point barrier for the season. The other sides making up the Isthmian Premier next year will do well to note that. I’d imagine Hornchurch won’t be looking to do the consolidation thing.